Since my soap-making supplies arrived from Brambleberry earlier this week, I have been happily trying out soap recipes. 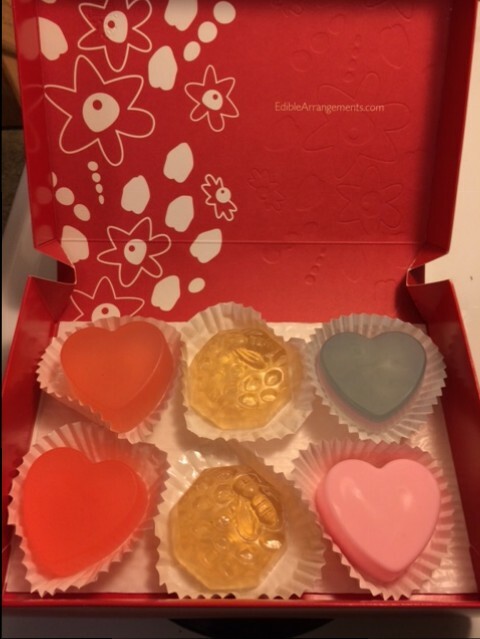 I ordered a sample set of melt-and-pour soap bases, a sample kit of floral fragrances, three of Bramble Berry’s Colorblock colors, a heart-shaped silicone mold by Wilton, and a kit for making “bee” soap which included the soap base, fragrance, and adorable bee-on-a-honeycomb mold. I made my first batch Tuesday night using the “bee” kit. I followed the super-easy instructions that Bramble Berry included in the shipment, and I had already watched one of the online tutorials at their sister-site Soap Queen. I struggled with getting the right amount of fragrance because I didn’t have a dropper, but the first batch came out really nicely. 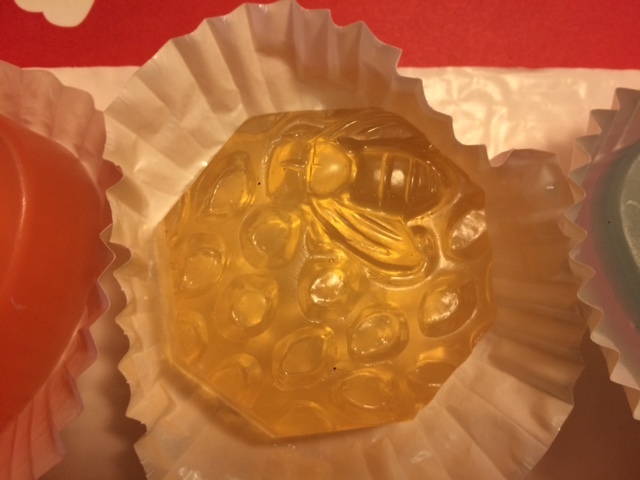 I love the bee mold – it’s so cute! (Don’t worry – there are pics further down.) The only problem was that I really didn’t have a good place to store the soap once it was ready. I didn’t have any way to wrap it up (Saran wrap, paper, etc. ), or a place to stack it, since we have no linen closet. So, I put the completed soaps into a bag and put them under the sink, feeling rather dissatisfied that I didn’t have a better place to store them. 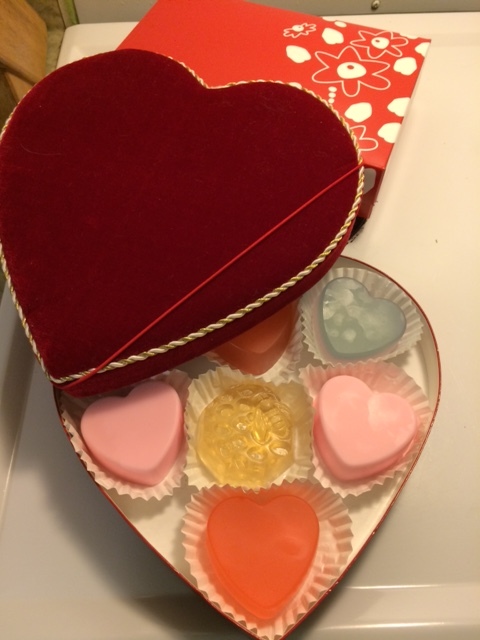 Now back when I cleaned out above my refrigerator (insert link here), I came across an old, but in excellent condition, Valentine’s candy box. I love those heart-shaped boxes and always have trouble parting with them. I have repurposed several over the years to hold quilt projects, cards, embroidery threads, and what have you. When I saw this one, I got inspired. 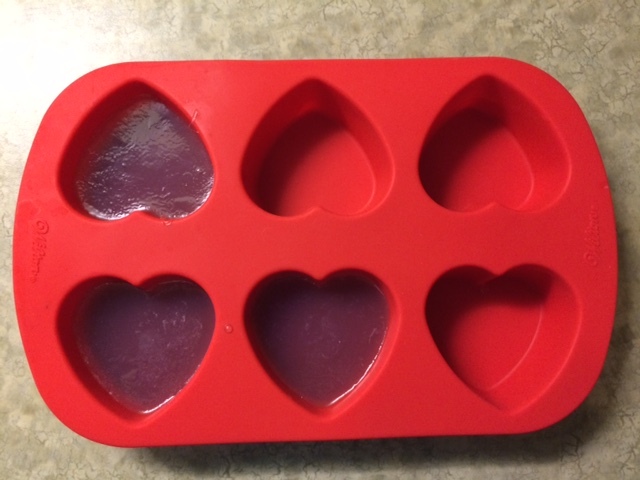 I had already ordered my soap supplies and heart-shaped mold. 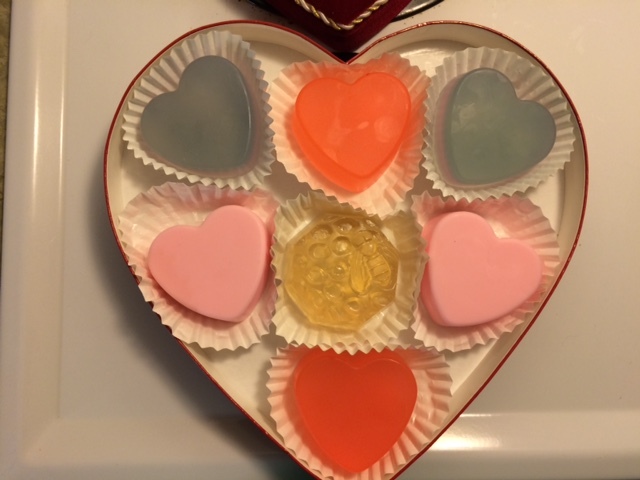 I could make some heart-shaped soaps, in different colors and scents, and place them in the Valentine’s box as a Valentine’s gift for my parents! Now I usually don’t give Valentine’s gifts to my parents (or really to anyone other than Steve), but I STILL haven’t finished their Christmas quilts (I have been sick! ), and we will be visiting them Valentine’s Day weekend. So I thought this would be a nice treat, and would soften the sting of “I still don’t have your Christmas presents”. Plus, I really wanted an excuse to make soap! 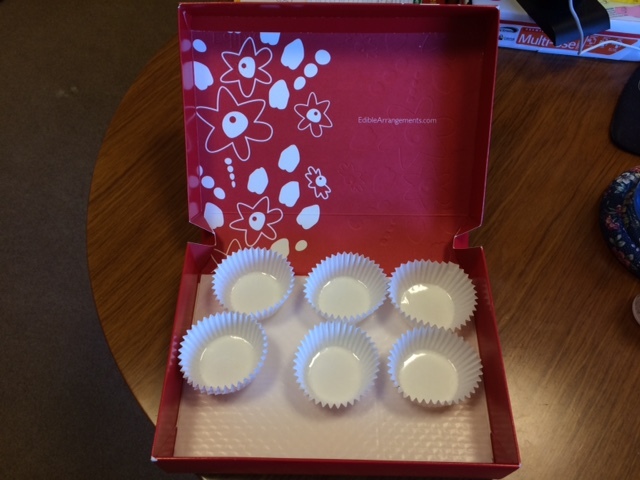 Now as luck would have it, someone sent some DELICIOUS Edible Arrangements chocolate-covered strawberries to our office, as a “thank you” for some work we did. The strawberries came in the prettiest boxes, which I quickly claimed as my own, once they were empty. Each of the strawberries rested on a wax-coated cupcake liner. The wax coating made the liners easy to clean, so I snagged them as well. As you may have guessed, I determined that these boxes were PERFECT for holding my bee-yootiful soap! The liners allowed the different fragrances to sit slightly away from each other in the box, like little candies. 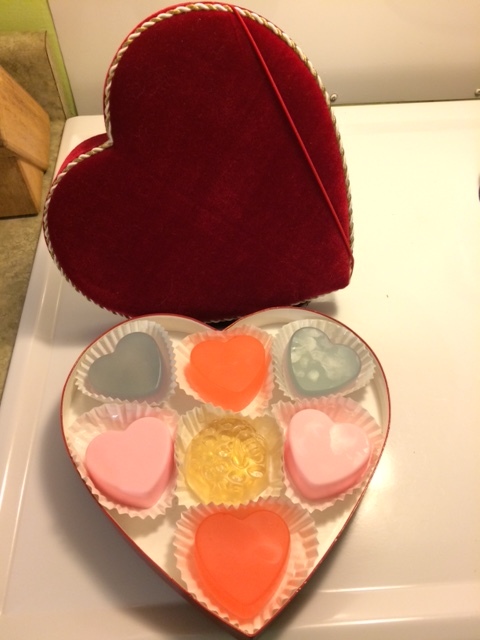 … and used the pretty Edible Arrangements box for our soaps! I love how they look like little frosted cakes! Look at the adorable detail on the bee soap! The above pics are not wonderful, as our kitchen is not really lit for taking pictures, but you can see how PRETTY both boxes are. I think my parents will love it! As an aside, I have been using a bar of the honey-based bee soap in the bath and really like it. The scent is very light on your skin, and it makes wonderful lather. And you feel so clean afterwards. I will never buy bar soap again! So I hope everyone out there has a Happy Valentine’s Day! 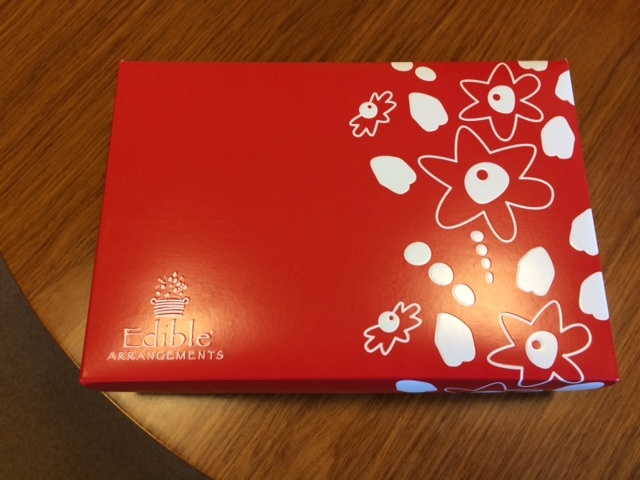 Even though the holiday is supposed to be dedicated to love and romance, I prefer to think of it as dedicated to eating chocolates from pretty heart-shaped boxes, which you can then repurpose to lovely effect!